Woodford Pudding is a wonderful dish to serve during the holidays, a derby dinner or anytime you have guests and family. This recipe for Woodford Pudding dates back to 1875. The spongy, spiced pudding is named after Woodford County in Kentucky. John Egerton speaks about Woodford Pudding in his book, “Southern Food”. This pudding is “gooder than grits” and “smack yo momma good”. That means you won’t be able to leave this pudding alone! It is just that tasty and the sauce is to die for. I could drink the sauce! If you make this recipe, be sure and let me know how you liked it. I think it will become a favorite. Cream butter and sugar. Add eggs and blackberry jam. Mix well. Add flour, cinnamon, and allspice and continue mixing. Pour in buttermilk and add soda. Mix well and pour into a sprayed 9 x 13 baking dish. Bake in preheated 325 degree oven for 45 to 50 minutes. Combine sugar and flour in saucepan. Add boiling water and salt. Mix well with spoon or whisk. Bring to a boil on stove. Cook to desired thickness, about five or six minutes. If too thick add more boiling water. Remove from heat, add butter, milk and vanilla and stir. Serve pudding warm with sauce on top. Woodford Pudding is a wonderful dish to serve during the holidays, a derby dinner or anytime you have guests and family. This recipe for Woodford Pudding dates back to 1875. Feel free to “share” with your friends by clicking on the Facebook or Pinterest buttons at the bottom of each post. You can print by clicking on the printer icon below. I have a family recipe for Woodford Pudding that is almost identical. In fact, the cake part is exactly what you have listed here. We just use a slightly different caramel sauce. It’s just butter, brown sugar and cream. Still makes a delicious “pudding” overall! Just made this. it’s perfect if you don’t like sickly sweet desserts. The sauce recipe is also a keeper for other uses. I think the cake would be fine if frozen. but is best served warm. I zapped it in the microwave for 25 seconds for breakfast – great w/ a cup of black coffee. Do You have a Cookbook? If so where might I purchase it???? We have one coming out in a few days, stay tuned! Look on the left hand side of any page on the website and put in your e-mail address. Where it says get notifications in the mail of new posts. You will get an e-mail telling there is a new recipe posted. You won’t get the recipes that are already on the site, just the new ones. So if it’s wood ford pudding…… Where’s the woodford? Woodford is the name of a county in Kentucky. The pudding is named for the county where it originated. I have never tried freezing this. can this be made with a different jam since I’ll be making this for my husband. He is allergic to all dark berries. please get back with me and let me know. I have never made it anyway but the recipe. I would think you could use something else though Ella. 1/2 cup or 8 tablespoons. Can I use milk instead of buttermilk? Yes, You can try it with milk. I always use buttermilk. You can always add vinegar to your milk ( 1 tbsps per I cup) as a substitute for buttermilk. I grew up in Tn. with my mother making Jam Cake with blackberry jam in the batter (home made) ! I had an old receipe that was cooked in a 13×9 pan with all purpose flour butter, buttermilk, buttrey crisco or butter cut up flour and butter together leave a cup out and mix the remainding ingredents together, buttermilk, baking powder, baking soda eggs etc place in pan and place dry ingredents on top. Icing is coconut, nuts, milk and sugar poured over cake with holes in it. Please help me find this receipe. Thanks! I made the Woodburn Pudding today. My family (I live with my daughter, son-in-law, and their 5 sons) LOVED it. This is the second “Southern Lady Cooks” recipe I have put to use – and, there will be more! hard—kinda like sugary fudge???? Thanks!!!!! Oh my! What a wonderful share! I saw your Woodford Pudding on your “The Southern Lady Cooks” Facebook page and had to come over to read the recipe. Pinning! Thanks for all the great recipes! Cheers! I have some homemade blackberry jelly. Wondering if I can use that instead of the jam. It looks delicious and want to make it today. I think you could but have not tried it using jelly. Anything which is an authentic and old Southern recipe is certainly worth making and I am going to make this very soon.. I fully expect it to taste as good as it looks.. I live in Woodford County, but not from here originally. I have never heard of this, even with all the church functions. It looks delicious, but I think it could use a little bourbon in the sauce. Yum!! Made this pudding a few days ago, everyone loved it, so moist. Would love to use strawberry, or apricot jam next time. What spices could I use instead of the cinnamon and allspice. I have never heard of this dessert before but it certainly does sound great. I am so pleased to come across your blog. I am new to Kentucky and looking forward to experiencing the flavors of the South. Congratulations on your patch! I have been anxious to try the Kentucky Jam Cake but I think I’ll be trying the Woodford Pudding first! I will let you know…but I suspect I’m going to love it. Thanks for sharing your recipes. I’ll be checking in for more! I canned WAY TOO MUCH blackberry jam last year, and I was getting tired of eating it on biscuits. Now, I know what I’m gonna do with it. Thanks for the recipe! 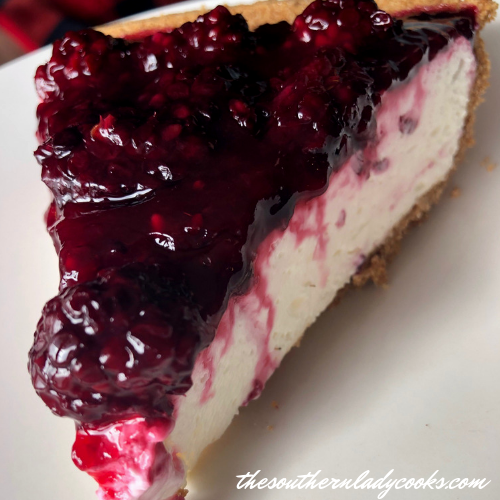 Another way to use your blackberry jam is to thin it a bit with orange juice and use as a topping for plain cheesecake. So delicious!! I’m making this delicious looking recipe today but when I read the recipe for the butterscotch sauce, the directions say to add salt but there are no measurements. Any suggestions anyone? Hi Karen, I just saw your comment. I add about 1/4 teaspoon salt. Sometimes, I don’t even add it. Let me know how it turns out for you! I made it with blackberry jelly, country crock, wheat flour, and milk, for the substitutes. I ran out of grocery money, so improvised with what was on hand. Wasn’t sure about the swaps, esp the flour in the sauce, but, it is really good!!!!!! I cooked the pudding for 46 minutes, we are not a big pudding cake people, and the texture would have thrown them off, and it was perfect. It has a cake top and a pudding-like texture, but not so much that it is runny…..mmmmmmmmmm don’t expect it to last much longer. When I saw the picture of this cake I had a sense memory about it, but I remember it as cold. I could feel it in my mouth and it was really good. My great grandmother came from Kentucky and my grandmother cooked a lot. She was born in central Texas, so I’m pretty sure they probably put pecans in it. I’m sure it was a recipe she made and what I am remembering is the leftover cake. I’ll try it soon…like when the heat wave abates some. My family lives in Ohio, but my father’s family originated in the ‘hills’ of Kentucky. Love that this is an old recipe, thank you for sharing. I think I’ll make ‘Woodford Pudding’ as a Father’s Day treat… thanks for helping me make his day a little more special! Made Woodford Pudding and sauce this afternoon, will be taking it to a Bible Study group meal tonight. Smells divine! (of course I licked the sauce spoon and its so GOOD!) Will update you after friends sample it tonight. Thanks for all the recipes! I live in Lawrenceburg, Ky. I’m always looking for something different to cook- hate cooking the same old things all the time. Desserts tend to be my favorites though. Our youth minister says he hasn’t ever seen anybody that surfs the internet as much as I do checking out recipes! He enjoys the dishes that I drag in for him to sample though. Nothing like a good southern pudding. This sauce looks wonderful.